Eleven people died, including a young child, when a string of tornadoes ripped through North Texas Saturday, officials said. 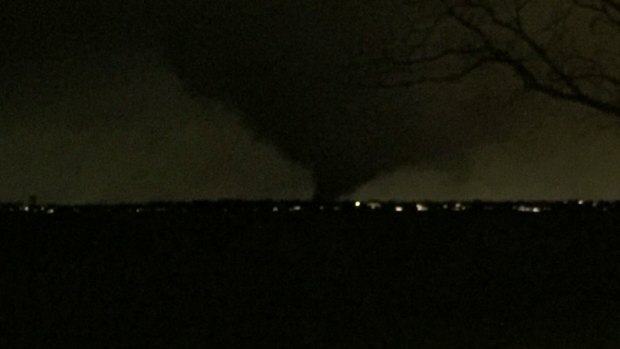 The National Weather Service said an EF4 tornado tore through Garland and an EF3 tornado cut a path through Rowlett. On Sunday, the NWS reported that damage in Copeville, on the east side of Lake Lavon in Collin County, was consistent with an EF2 twister. The NWS also reports separate EF0 tornadoes in Blue Ridge, south of Sulphur Springs, northeast of Emory, northeast of Eustace, and in Hubbard. 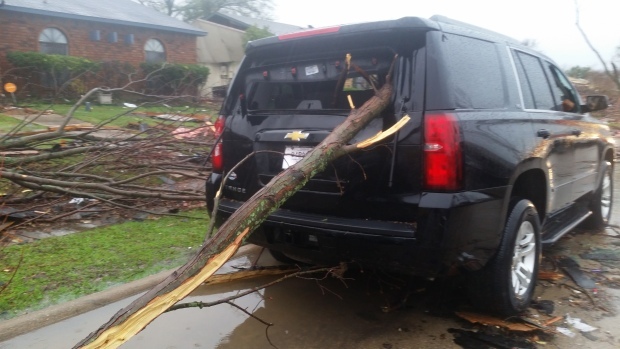 NWS survey crews are also working to assess the damage in the Ovilla/Glenn Heights area. The devastation came into focus Sunday in North Texas, where local officials estimated as many as 1,450 homes were damaged or destroyed. Vehicles were mangled, power lines had fallen and trees were toppled. The storm blew the roofs off homes and caused natural gas lines to burst. Heavy rain, wind and dropping temperatures hampered cleanup efforts Sunday afternoon. Cecil Lowrie was the first victim identified after the storms. According to his niece Rachel Maddox, Lowrie and his wife Evelyn were driving home from dinner on Interstate 30 when the tornado struck. Lowrie's wife is at The Medical Center of Plano in critical condition. Kimberly Tippett and her 1-year-old son Kamryn Crain were also killed during the storms. Residents return to 289 units at at an apartment complex in Garland to collect personal items after an EF4 tornado damaged the building Saturday. Eight people died, 15 were injured and about 600 structures, mostly single-family homes, were damaged in Garland, the suburb about 20 miles northeast of Dallas. "This is a huge impact on our community and we're all suffering," Garland police Lt. Pedro Barineau said. The weather service said an EF4 tornado — which is the second-most powerful with winds up to more than 200 mph — struck hit the community at about 6:45 p.m. Saturday. Natalie Guzman, 33, took photos of her family's home in a neighborhood. 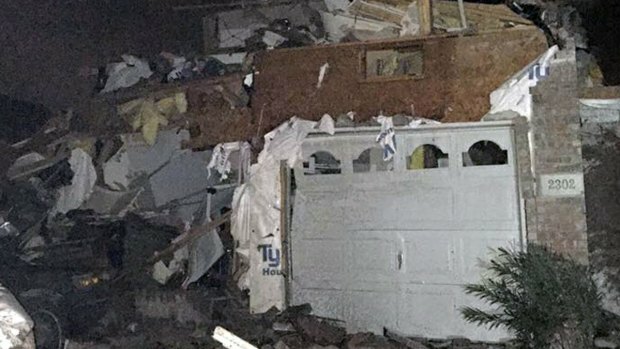 The garage wall had collapsed and the roof fell in. The only part of the house that appeared to be spared was the master bathroom, where her brother-in-law took shelter Saturday night. He was the only one home and said had just enough time to get himself and his dogs into the bathroom. Barineau said the single tornado hit at about 6:45 p.m. Damage stretched across an area of 2 square miles near the intersection of Interstate 30 and George Bush Turnpike, a major route in the region. "Driving around the area, you can see that it's total devastation," Barineau said. "This is a huge impact on our community and we're all suffering." At least three people who died were found in vehicles, Barineau said, also noting that some cars appeared to have been thrown from the interstate. In the nearby town of Rowlett, City Manager Brian Funderburk said Sunday morning that 23 people were injured, but there were no deaths and no reports of missing people. The weather service said damage indicated it was likely an EF3 tornado, with winds up to 165 mph. "As of right now, we are still in the search and rescue mode," said Rowlett Police Department spokesman Cruz Hernandez. "We still have some homes that have been demolished and not everyone in the homes has been accounted for." 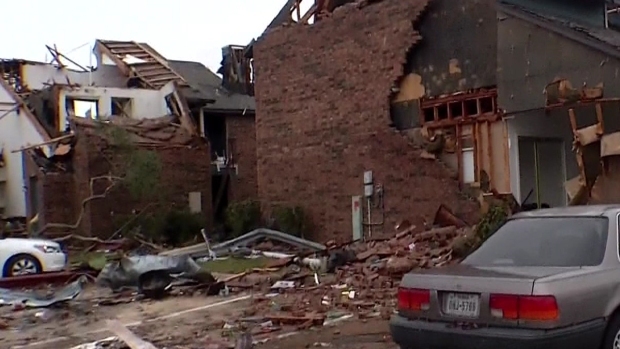 NBC 5 Meteorologist David Finfrock talks with David Collins who lost his home in the tornadoes. David Collins takes us inside his damaged home. Homes in the neighborhood that had been searched by emergency responders were marked with a black "X." It looked like some had been picked up and set back down in a big pile. State troopers blocked off roads, utility crews restored power and people milled around, hushed and dazed. Residents were being kept out of part of east Rowlett and heavy equipment was brought in to move debris from homes where people may be trapped inside. Rowlett Mayor Todd Gottel talks about the tornadoes that tore through his city leaving 23 injured. Gov. Greg Abbott released a statement late Saturday that said members of Texas Task Force 1 have been activated to support the ongoing search and rescue efforts in North Texas. Meanwhile, on the other side of the state, a snowstorm accompanied by plunging temperatures was expected to leave up to 16 inches of snow in West Texas and much of New Mexico through Sunday evening, according to NWS meteorologist Brendon Rubin-Oster in College Park, Maryland. "It's going to be quite dangerous for anyone exposed to these elements," he said. Authorities in Collin County said 51 structures were severely damaged and another 15 were moderately damaged. The Ellis County Emergency Management Agency said about 40 homes were damaged or destroyed. Two people were transported to hospitals with injuries that were not life threatening and several others were treated on the street for minor injuries, officials said. Todd Gottel, the mayor of Rowlett, issued a State of Disaster declaration after deadly storms tore through portions of North Texas. Additional shelters will be opened as needed, according to American Red Cross spokeswoman Anita Foster. A shelter set up at Longbranch Elementary School in Midlothian was transitioned to a respite center. On Monday, Red Cross workers will distribute clean-up supplies like tarps, shovels, rakes and more to help affected families salvage what they can. If you need to let someone know you're okay, or need to check on a loved one go to http://RedCross.org/SafeandWell or call 1-800-REDCROSS. Anyone interested in helping the storm victims is asked to make a donation to the American Red Cross Disaster Relief Fund at http://www.redcross.org or by texting REDCROSS to 90999 to donate $10. 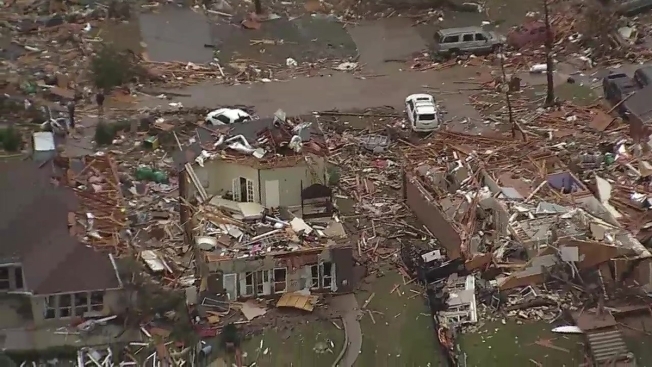 Chopper 5 toured storm damage in North Texas on Sunday. 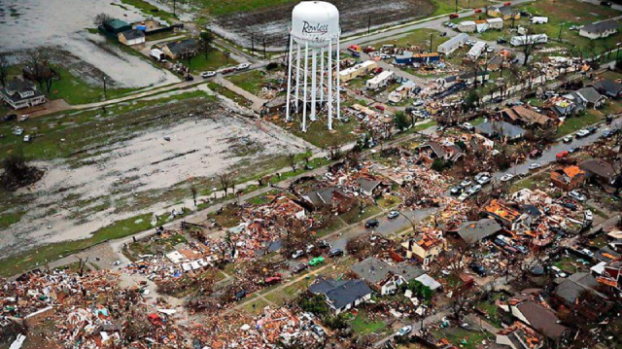 Tornadoes left paths of destruction in multiple communities. Passengers waiting for flights at Dallas Love Field Airport were temporarily moved away from windows during the storm. Flights were also temporarily halted from Dallas/Fort Worth International Airport. The Dallas Mavericks NBA game was delayed about half an hour because of the storm. The Associated Press' Seth Robbins, Nomaan Merchant, David Warren and Reese Dunklin and NBC 5's Todd L. Davis contributed to this report.